In reviewing Teva's new Loop-d-Loop book I started thinking about other things I've knit from her. 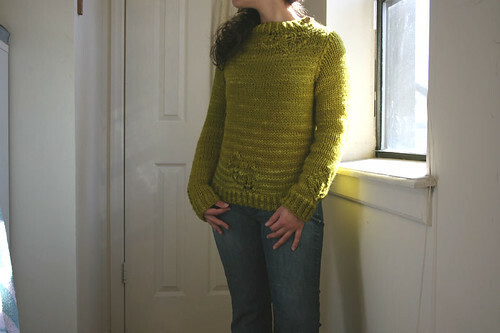 Perfect for Flashback Friday, this was the sweater that made me fall in love with Teva Durham! It was also one of the quickest sweaters I've ever done. What's so cool about this sweater is it's construction. You work the top and then the bottom seperately and graft them together in the middle. I was pretty proud that you couldn't *quite* see where it was seamed unless you really were looking for it. It amazed me so much how Teva could think outside of the box like that. Again, the pure artist in her. The yarn I made it in was Sheep Shop 2. When Patricia got her first shipment of Sheep Shop, I had immediately connected the yarn to this project. It's too bad that since then the yarn and company are now defunct. I am excited to knit something from her new book, which is chock full of great designs like this one. I LOVE this sweater! You should wear it more often. ooh, what a great idea! A knits in review. that is a beautiful colour. I met Teva Durham a few weeks ago at one of those First Night things in Jersey City and got to chat her up a bit. I love her patterns. She was a friendly girl – to the commenter above, I’d say send her a message on Ravelry with your questions about the pattern. That’s a shame about the company now being defunct. That’s a gorgeous yarn, AND sweater. How interesting to graft in the middle like that. I can’t see where it’s joined at all! No worries!! i’m glad it’s all figured out. 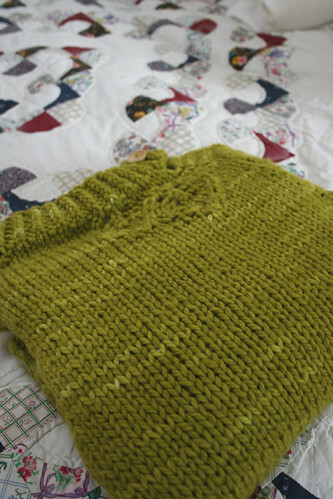 Once again, the bajillion reason why I love Ravelry – the help it gives to all us knitters! Make your life easier get the personal loans and everything you want.